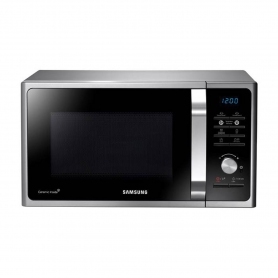 This stylish solo microwave oven from Samsung looks modern and hi-tech, and is armed with a range of features to heat and cook to perfection. Offering 23 litres of capacity and 800 W of power, the MS23F301TAS is equipped for all your microwaving needs. The MS23F301TAS comes with 20 pre-set cooking modes, meaning the days of ready meals are a thing of the past. Enjoy fresh and healthy meals cooked in minutes at the push of a button, whether they are light bites, or dishes for the whole family. Equipped with Triple Heat Distribution, this helps to ensure that food is cooked thoroughly and evenly, by distributing the microwaves from three different areas, resulting in a broader coverage. Cooking with your microwave is one of the most economical forms of cooking available - using this handy appliance instead of your main cooker can save you money on your energy bills. The MS23F301TAS comes with an ECO mode too, which makes the appliance use even less energy, and also reduces its environmental impact. 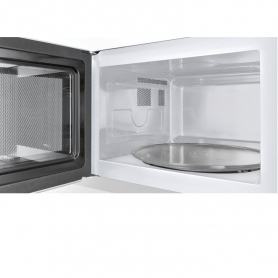 Keep your microwave as good as new thanks to the easy clean ceramic interior of the MS23F301TAS. Its smooth surface is anti-bacterial and resistant to general wear and tear – this means it will carry on looking great, and provide a hygienic, easy to clean environment for your food to cook in. The deodoriser will also help to get rid of any strong smells. Samsung is known for designing great looking devices and appliances, and the MS23F301TAS is no exception. The smart stainless steel finish and black glass front look modern and stylish, enhancing your kitchen worktops. The crystal blue LED display is crisp and clear, and coupled with the silver dials and controls, makes using the MS23F301TAS really simple. If you’re after a great looking, spacious, and feature filled microwave, you’ll love the Samsung MS23F301TAS. Order yours today.